The Oscar®-nominated documentary short, PERIOD. END OF SENTENCE., will launch globally on Netflix on February 12th. Directed by Rayka Zehtabchi, PERIOD. END OF SENTENCE. 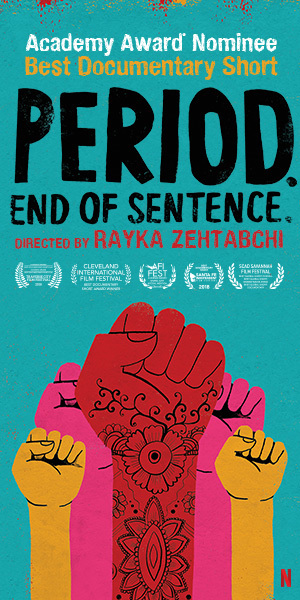 follows a group of women and girls in rural India who work together to operate a machine installed in their village to make sanitary pads and combat the crushing stigma of menstruation. Acquired last month by Netflix, the film is produced by Zehtabchi, Los Angeles English teacher Melissa Berton, Garrett Schiff, and Lisa Taback. Avery Siegel, Carly Gatto, Charlotte Silverman, Claire Sliney, Helen Yenser, Ruby Schiff, Sophie Ascheim, Guneet Monga, Mandakini Kakar, Stacey Sher, Doug Blush, Anissa Siegel, and Bob Gatto executive produced the short film. The documentary short double-qualified for the Academy Awards in 2018, winning jury and audience awards at Michael Moore’s Traverse City Film Festival and Cleveland International Film Festival. The film also took home jury and audience awards from AFI FEST, among other festivals, and is now nominated in the Documentary Short category of the 91st Academy Awards®. The film continues to inspire students to realize their power in thinking globally and recognize the impact young women can create.